What does it take to reform school food programs, and provide more fresh, healthful and tasty meals to our nation's kids? Cafeteria Man takes a candid look at Tony Geraci's sweeping, tenacious efforts to kick start school food reform in Baltimore's schools, a large urban district that serves 83,000 students, and later Memphis, with 200,000 students. As the newly hired Food and Nutrition Director of the city's public school district, Geraci hatches an ambitious, multi-faceted plan to feed students healthy, locally-sourced meals, teach them nutritional awareness, and offer them training and vocational opportunities in the world of food. His bold vision includes a 33-acre teaching farm, school vegetable gardens, student-designed meals, and meatless Monday's. 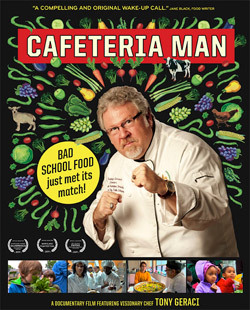 Cafeteria Man follows Geraci for two years as he partners with a dedicated group of parents and students to overhaul a long-established, dysfunctional lunch program and battle the entrenched bureaucracy behind it. The film profiles Baltimore's experience as it becomes recognized as part a burgeoning national movement, and includes appearances by food author Michael Pollan, First Lady Michelle Obama, and Assistant White House Chef Sam Kass. Featuring the voices and images of students, parents, administrators, teachers and farmers, the film vividly documents this hopeful story, as well as honestly portraying the challenges. It makes clear that successfully transforming school lunch programs is not easy, and ultimately requires sustained efforts by a broad coalition acting on behalf of students. Visit the CAFETERIA MAN WEBSITE for more information and resources, as well as updates on Tony Geraci's work. "Richard Chisolm's elating movie about good-food guru Tony Geraci ... celebrates Geraci for his profound grasp of what healthful eating means to public school students." "A clear-eyed look at transformative change in school food, permeated by an infectious sense of possibility." "A compelling and original wake-up call. Cafeteria Man shows us that improving school food isn't about nutrients and recipes — but vision." "A feel-good approach to advocating for healthier, and more local school lunches." "A documentary about one determined individual's battle against a rigid status quo, filmed with honesty, compassion and humor."